Champagne alone is enough to attract visitors to Reims. This city is home to distinguished champagne brand names like Veuve Clicquot, Taittinger, Pommery, Mumm, Lanson, Martel, Ruinart, Canard-Duchêne and Piper-Heidsieck. With such a concentration of brand name champagnes, there can be no doubt that Reims is a city with a serious champagne reputation. And for the visitor who’s interested in visiting the cellars of Reims, there are 120 kilometres of champagne cellars to explore. You can do this on your own or benefit from the knowledge of a local guide through one of the many champagne tours. And where there’s excellent champagne, there’s plenty of good food as well. In Reims, the visitor is never short of restaurants or cafés to choose from. But there’s much more to Reims than its famous champagnes. In 498, Clovis, King of the Franks was baptized by the bishop Remi, making him the West’s first Catholic sovereign. This important event made Reims the chosen city for crowning French kings. Since the 11th all the Kings of France came to this city to be crowned in the splendid Cathedrale Notre Dame. In fact 33 kings were crowned in the cathedral of the “The Coronation City”. Reims’ history goes back more than two thousand years. According to legend, the city was founded by Remus, the brother of Romulus, founder of Rome. This city of art and history has four World Heritage listed sites which should not be missed – the Cathedrale Notre-Dame, Saint-Remi Basilica, Saint-Remi Museum and Palace of Tau. Apart from these World Heritage sites, there are many other monuments that tell of a particular time in Reims’ history, such as the Roman Mars Gate and Cryptoporticus. Reims suffered heavy bombardment during the First World War and almost 80% of the town was destroyed. Ironically, it was in Reims that the commander-in-chief of the Wehrmacht signed the surrender of Nazi Germany during the Second World War. In July 1962, the Notre-Dame Cathedral witnessed another historical event – the German Chancellor Adenauer and General De Gaulle sealed the reconciliation between the France and Germany in the Notre-Dame Cathedral and Reims was set up as a peace symbol between the two countries. When all the monuments and history become too overwhelming, one can retreat to one of Reims’ many parks such as Le Parc de la Patte-d’Oie, considered to be the most beautiful park in Reims, Le Parc de Champagne or The Pierre-Schneiter Horticultural Garden with its rare tree specimens. 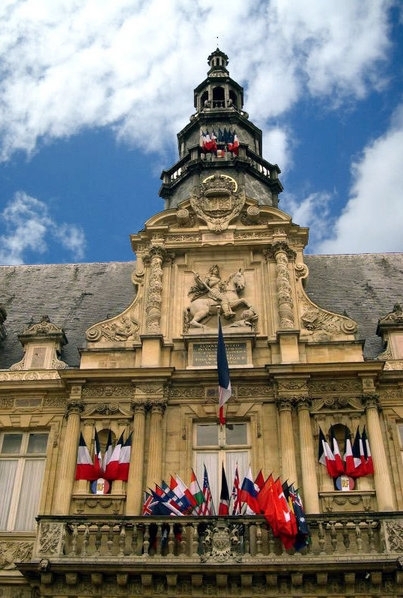 Reims is a “4 Flowers” city, an award that recognizes French towns for their parks and gardens. 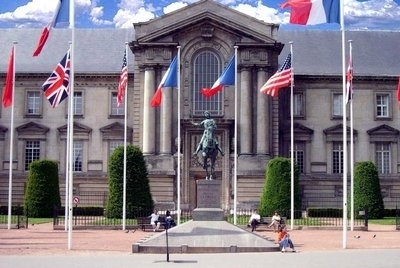 With more than 20,000 students, Reims is today an important university town. The city has served as a centre of higher learning since 1548. There is a good range of accommodation here, but the city fills up when there is a major event in town. The Best Western Hôtel De La Paix is a design hotel set in the heart of Reims.The Holiday Inn Garden Court is another hotel that is ideally located in the historic centre of Reims. And for those who prefer self-catering apartments, the Séjours & Affaires Reims Clairmarais offers apartments free wired internet access. For the complete list of Reims accommodation, see HERE. Reims is located in the north-east of France and is a sous-préfecture of the Marne département, in the Champagne-Ardenne administrative région. Paris Roissy International Airport (www.adp.fr) is located 30 minutes from Reims.